Home Good Website How to SEO Tricks Tech Tip Search Domain Names Smartly. Having a good Domain name is equally essential to get more and more traffic. Many people decide to visit a website just based on its name which is lame but kind of very true. So how would you smartly search a good and cheap domain name? 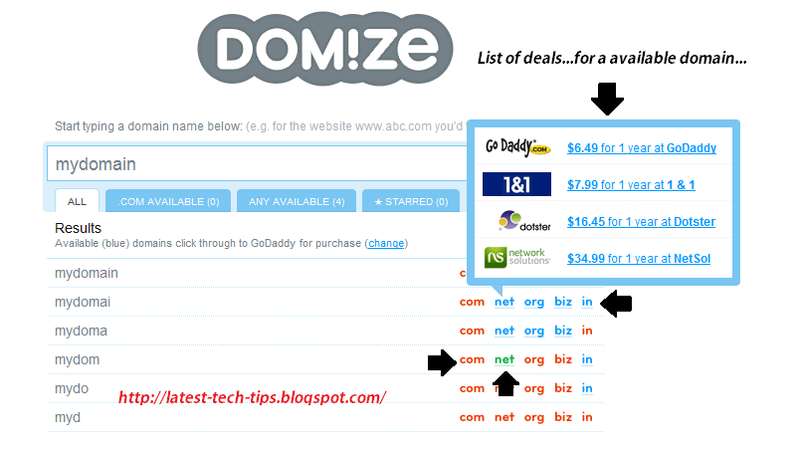 I came across a very good site for this, called Domize.com. It has a very simple interface and gives very good suggestions. Also it shows all the available domains names your are searching for including different pricing options from different Domain registrants. It shows all the domains and the ones which are red are already gone and the ones which are available are marked in blue. The green ones are the ones which are exclusive and ofcourse expensive domains. You can choose the deal you like and once you click on your choice you will be automatically redirected to the respective Domain Registrant. You can go ahead and registrar your own domain in a matter of few clicks, its that easy. You might want to read may such SEO Tricks to get more and more traffic.